With AlwaysFreshFish.com being located on the New Jersey Shore it has given our company a tremendous advantage in purchasing extremely fresh fish from our local boats and docks. Our company also purchases fresh Swordfish throughout the Atlantic Coast. The Atlantic Coast Swordfish is one of the only Swordfish industries which regulates and monitors it resources of Swordfish. Fresh Swordfish have firm tan colored meat with a unique flavor that is not matched by other seafood. It's texture is firm and has a delicious rich flavor. At AlwaysFreshFish.com we receive whole fresh Swordfish which is then cut off the bone to order. The majority of our fish is shipped to restaurants, institutions, and fish markets. Your Swordfish order will be cut fresh off the bone, steaked, packaged, and delivered to you via an express shipping company. Your Swordfish Steaks will average 6-12 ounces. please let us know and we will be happy to cut it for you! 1 lb. Fresh Swordfish + 4 lbs. Add. Selections = 5 lb. Total Order OK! 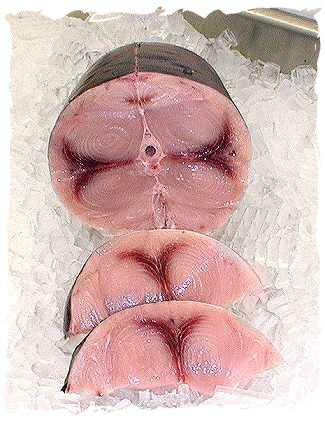 Rinse Swordfish Steaks under cold water and let drain. Preheat Oil in skillet on medium heat and add Swordfish. Add Vinegar, Chicken Broth, and Mushrooms. Sprinkle with Paprika and Garlic Powder. with a fork. Do not overcook. Swordfish should be served slightly juicy. For additional information on Fresh Swordfish, please e-mail AlwaysFreshFish.com.